PRESCOTT – When the residents of Paulden want to buy more than just basic groceries, they must drive to the next town over in Chino Valley to find a full-service grocery store. Paulden resident Maria Reyes said she buys her eggs, vegetables and meat at the nearby Prescott Farmers Market, but it helps that she works there as well. For Paulden residents, the lack of access to fresh food can range from a mere inconvenience for some to a major challenge for those without transportation. The U.S. Department of Agriculture has designated Paulden a “food desert,” an area that lacks immediate access to healthy, affordable food. Many Arizona communities have long struggled to address the issue. Local experts say there are a variety of ways to alleviate these hardships. Some solutions include broadening government-assistance programs, growing community gardens and building supermarkets. But because food deserts most often occur in rural and low-income areas, some solutions work better than others. For example, adding a supermarket to a community isn’t always viable. John Andrews, a professor at Queen’s University in Canada, said markets are often conservative and reluctant to open stores. They look at population trends and an area’s median income before investing in new properties. It can get expensive to buy fresh fruits and vegetables. And it’s not uncommon for people who use the Electronic Benefit Transfer system, formally known as food stamps, to live in food deserts, said Kelly Rivas, the manager of the Prescott Farmers Market. The lack of available grocers often leads people to rely on drug or convenience stores for food. But local farmers markets can provide a healthy alternative. Some of these markets have begun offering a program called Double Up Food Bucks, which provides extra money to spend on produce for those using their EBT cards at grocery stores and farmers markets. 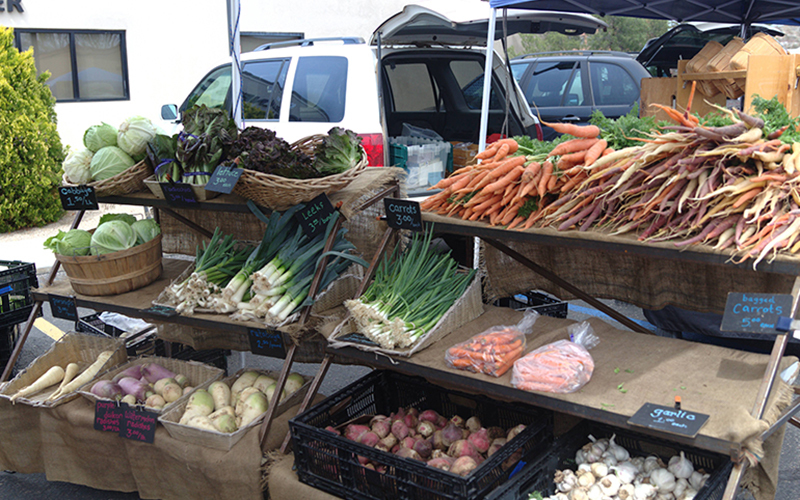 The Prescott Farmers Market is one of those markets. Shanti Rade, the co-owner of Whipstone Farm, sells goods at the Prescott market. She said the program not only provides better food, it can help educate the public. She said farmers can provide information about the plant, including potential uses and recipes. In the middle of a food desert in Tucson, the Community Food Bank of Southern Arizona has grown its community garden into a community farm. 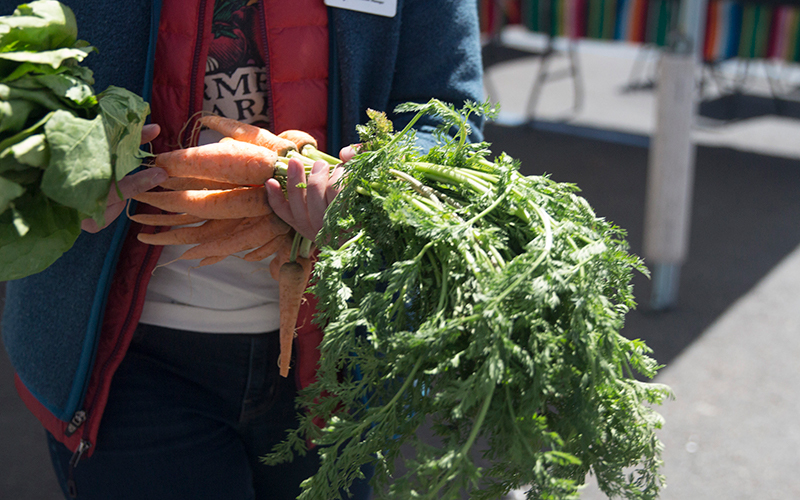 For the past six years, the food bank has operated the Las Milpitas Community Farm. “We are in the heart of a food desert,” farm manager Chris Lowen said. Lowen said that across the street from the farm, thousands of low-income residents live in a trailer park and require food assistance. Lowen said they conducted a survey and found that 70 percent of those who use the farm have monthly household incomes of $2,000 or less. The farm provides an opportunity for community members to grow and learn about healthy foods. The food bank provides about five kinds of seasonal plants per plot for their gardeners, who also have the option to plant their own food. Lowen said community members in need can use a plot if they volunteer at least three hours a week to help maintain the overall farm. Lowen mentioned that one of the farm’s goals is to empower community members to become leaders. Downtown Phoenix will soon get a new Fry’s Food Stores, which may help alleviate the food desert there. As more people moved downtown, the lack of grocers became apparent to officials at RED Development, which is developing the project. Jeff Moloznik, vice president of RED Development, said the decision to build had more to do with the growing population than anything else. A previous version of this story misstated Phoenix Councilwoman Kate Gallego’s title. She is no longer vice mayor. Andrews, the executive director of the Queens Real Estate Roundtable, said in downtown Toronto, they had a difficult time getting a market. The city wanted to attract more residents with a market, and the grocers did not want to invest in the space until enough potential customers lived there. The city of Phoenix will provide $18.3 million in incentives, and RED Development broke ground on the new market on April 13. The project, at Jefferson and First streets, is slated for completion in 2019. The project also will include apartments, office space and other retail uses.